Travis Yost has been involved in the world of hockey analytics for a decade and is part of TSN's Hockey Analytics team. Prior to joining TSN, Yost was a contributor at the Ottawa Citizen, the Sporting News and NHL Numbers, and he has been a consultant for an NHL franchise. He will be contributing breakdowns on the Buffalo Sabres for The Buffalo News this season. Follow Yost on Twitter: @travisyost. Whenever a hockey organization struggles for an extended period, the blame game seemingly runs a rather predictable course. The coaching staff is usually the first to fall on the sword. Not soon after the coaches are blamed, targets get placed on the backs of players. Once the coaching staff and personnel has been churned through a couple of times over, attention turns towards the front office. I always find that ironic, mostly because no group owns a bigger piece of the pie than management. Members of the management team are the ones who hire the coaches. They sign the players. And when things go awry, it tends to be a "them, not us" scenario. That brings us to the 2018-19 Buffalo Sabres. The Sabres predictably fired head coach Phil Housley, just two years removed from the termination of Dan Bylsma (2016-17) for similar performance issues. When pressed on the firing, the players – as they always do in NHL circles – tried to own their failures and hold personal accountability. An admirable trait, and surely for some players on the roster, a worthy exercise. At the forefront? Sabres center Jack Eichel. The same is true for Eichel and his tenure in Buffalo. 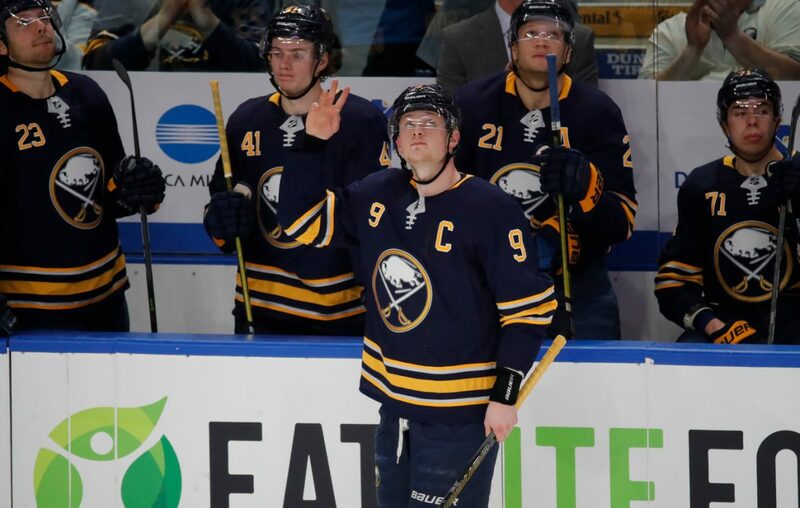 Players such as Eichel tend to be the ones taking the tough questions and trying to hold their entire lineup responsible for performance, but the reality is quite different. Consider the Sabres in the Eichel era. We can look at a distribution of every regular Sabres skater, by calendar year, for how many wins were created over each regular season. 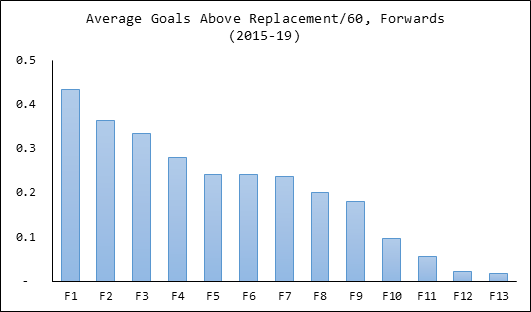 What you end up seeing is that this Sabres team has just not had any support behind Eichel, and to that end, we really should be focusing our attention on the efforts related to roster building. So let’s take a look at what the Sabres have done over the Eichel era. I mentioned earlier that the Sabres have had two coaches already for Eichel and company, and the same is true for general managers – Tim Murray ran the show from 2014-17, and Jason Botterill has been the man in charge since May 2017. The only year in which Eichel didn’t meet the average goals above replacement threshold relative to his deployment was during his rookie year, in which (A) results were still very good; (B) he was 18 years old; and (C) a rookie on a bad team. Since then, he’s not only been the star of Buffalo’s team, but compares favorably to your average first-line forward around the league. That’s a huge distinction, in my opinion, and helps isolate on where the real challenges are – further down the lineup. Outside of Eichel, the previously traded Ryan O’Reilly – and Jeff Skinner for one year – Buffalo just hasn’t had much talent to offer. It makes the decision to fire Housley rather fascinating. Coaching performance and front-office performance should be mutually exclusive, but they’re often very intertwined. By firing Housley, the front office is arguing – at least in part – that there is more value to squeeze out of the lineup built up over the past few years. I will let you opine as to whether or not that’s true. Even Botterill had acknowledged he needed to do a better job in building the roster. Housley isn’t without criticism. 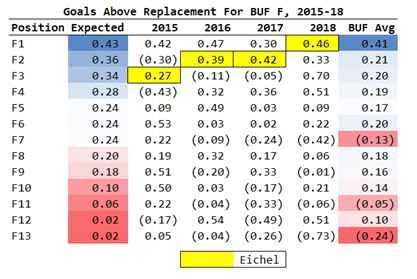 But one thing does appear certain: This team grades pretty low on hockey talent away from Eichel and his linemates, and until that changes, Buffalo’s playoff aspirations will always seem like a pipe dream. And that’s true no matter how many bullets Eichel wears for the suits in the Sabres organization.